Links to video and audio segments in which individuals describe their NDE. Near-death experiences (NDEs) that resulted from a health crisis, submitted since 2006. Near-death-like experiences (NDLEs) that were not the result of a health crisis, submitted since 2006. Links to an older archive of NDE experiences of both types, accounts submitted 2002-2005 are at the bottom of this list. These NDE accounts were submitted to our website and are published here anonymously. Minor edits have been made to protect the identity of the experiencer and others who may have been involved with the experience. Note to researchers and authors: IANDS cannot grant permission to publish quotations from these NDE accounts because we have not received permission from the NDE authors to do so. However, we advise authors who wish to use quotations from these accounts to follow the Fair Use Doctrine. See our Copyright Policy for more information. We recommend adopting this practice for quotations from our web site before you have written your book or article. In this area, you can find NDE accounts told by someone other than the experiencer. Like the other accounts, these have been lightly edited to remove direct references to actual names and places. Note to researchers and authors: IANDS cannot grant permission to publish quotations from these NDE accounts because we have not received permission from the NDE authors to do so. However, we advise authors who wish to use quotations from these accounts to follow the Fair Use Doctrine. See our Copyright Policy for more information. We recommend adopting this practice for quotations from our web site before you have written your book or article. Welcome to the new NDE video and audio section, featuring individuals describing their near-death experience. Some of these NDE accounts were recorded at various IANDS sponsored events; others are from the news media. A few derive from other sources. All of these links are to video or audio files that are in the public domain on the Internet. Most reside on youtube.com, the largest repository of non-commercial video on the internet, and we link to them. (With each segment, youtube.com will post thumbnail links to other videos. The quality of those — and sometimes the content — will vary. We are unable to screen their links, as they frequently change.) A high-speed Internet connection is highly recommended to view these NDE accounts. These are samples of previously published NDEs of the Month which are sent monthly via email to members. 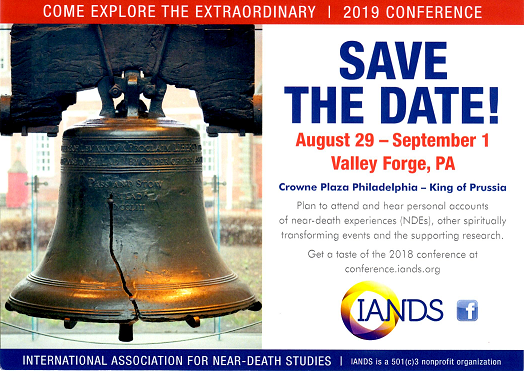 Join IANDS as a member to receive the NDE of the Month emails.